Bethany’s studio program has been producing Minnesota State’s hockey games for the past 18 years. This partnership has grown over time. In 2015, they began producing women’s hockey and operating the newly installed Daktronics video board giving Bethany students a great buffet of options to gain real experience. 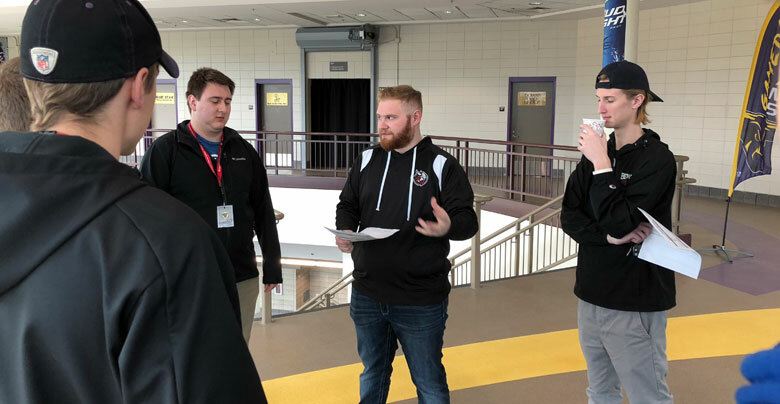 Minnesota State University benefits by having a high-quality product for their fans and the community, a win-win for everyone. The broadcast world changes rapidly. College sports on television has erupted over the past decade. The TV rights deals that ESPN and other networks have with specific conferences has allowed those large universities to build their own studios and production facilities right on their own campuses. For Bethany’s program, it is important to make the most of these opportunities. “I think this opportunity is very unique, ” said Junior transfer and Mankato native Louise Dhuyvetter. “You take it seriously. I would love to do it again.” Dhuyvetter served as the associate director communicating between the production and Fox’s master control team in Woodlands, Texas. Both Dhuyvetter and Rogers know broadcasting on a major network doesn’t come around very often. BLC Studios produced its first ever hockey game on a major network back on February 23, 2006, on ESPNU, a brand-new network for the media empire. Twelve years passed before the next opportunity came. Fox Sports North Plus picked up the Minnesota-Duluth vs Minnesota State game back in February of 2018. A great deal of pre-production and planning goes into broadcasting on a network. First, students need to realize that they are doing all the camera work and production and not a professional crew. Second, the production needs to look like Fox Sports. 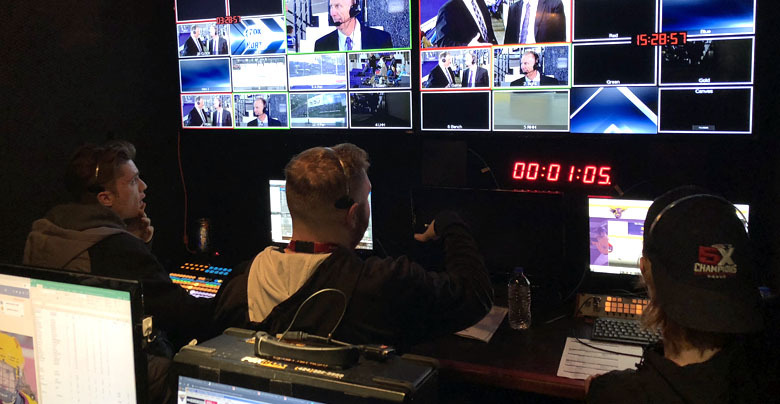 The Studio Manager, Greg Vandermause, coordinates most of the details with Fox Sports in Minneapolis and LA to ensure that Fox has provided all the elements needed to do a show on their channel. Then it’s up to the students to perform and show they are ready for the task. Opportunities to produce a game on a major network bear much fruit. The programs credibility grows with each game they do on Fox Sports. Students reap the benefit by being able interact with Fox through job shadowing and internships. BLC Studios, while only a twenty-year-old program, has placed graduates at ESPN, Fox Sports, ABC, WWE and so many more places thus strengthening the legitimacy of their program. While college hockey on TV nationwide isn’t a ratings driver, it is a big deal in the state of Minnesota, which houses five division one teams. At the end of the night, Fox Sports Operations Manager, Erich Manwarren said, “There is no reason we shouldn’t have more of your games on our network.” The students earned the opportunity and made the most of it. They are the reason this small college has a big reputation that continues to grow.